I’m Kat. My cosplay name is T3knic0l0r Calik0. I’m a big con goer and cosplayer. I wander around various anime, comic, and gaming conventions doing interviews with Josias for Play Legit. I’ve been cosplaying since 2008. I make my own costumes, tend to make a couple new ones every year. 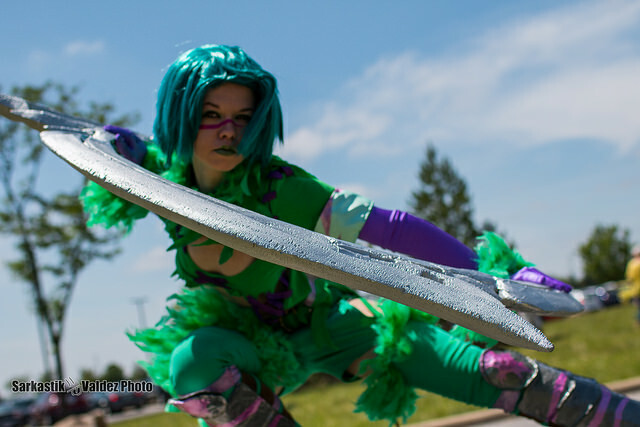 One of my big cosplays is Tira from soul calibur which was one of my favorite games growing up; starting with Soul Edge. Some other games I’ve enjoy over years would be the Diablo series, the Borderland series, Skyrim, Dark Souls, any of the Legend of Zeldas, Smash Bros., Pokemon games, various horror games, and so many others. I’ll try just about any game at least once. I plan to cosplay more from Soul Calibur and eventually Diablo. Some if my other cosplays include Fem Joker, Gloomy Bear, and various Pokemon gijinka. As well as the gaming, and cosplay, I also do art of various kinds; drawing, tattoo design, painting, sculpture, etc.